CyberLink PowerDVD is a media player for Microsoft Windows providing DVD playback, with Blu-ray playback available in higher editions. The current version is available in three editions: PowerDVD 16 Standard (DVD only), PowerDVD 16 Pro (Blu-ray playback) or PowerDVD 16 Ultra (Blu-ray 3D playback). Problem 1: Blu-ray disc won’t play on Blu-ray player: I have a powerdvd 10 version. When i use it to play blu ray disc, it failed. I get an error that says “You must update CyberLink PowerDVD now to continue the playback of this content” Then a Yes and No box. If I click Yes, then it says “Player application update” – “Update Complete”. If I click no, nothing happens. It just continues this loop over and over. Problem 2: Why am I not able to play some Blu-ray movies? I just bought my first Blu-ray disc. Lo and behold, it won’t play. PowerDVD tells me to update the software. So I do. I start the software again. PowerDVD again tells me to update the software. So I do. I start the software again. PowerDVD again tells me to update the software. And once again, I do. And then PowerDVD won’t even run at all. It crashes. I can’t get anything. Problem 3: PowerDVD won’t play Blu-ray: PowerDVD preinstalled on Lenovo computer came up with error message when launching and was forced to close. After updating, the progress bar of the DVD goes 99% and hangs there. Problem 4: I cannot play Blu-ray Disc movies with CyberLink PowerDVD. What can I do? Why won’t my Blu-ray movie play with the Cyberlink PowerDVD software? How to Solved “Cyberlink PowerDVD Blu-Ray Not Playing or Working” Problems? When you’ve encounter either one of the issues, you’ll be advised by Cyberlink support to upgrade to the latest version of PowerDVD. However upgrading may not solve the tough problems. Just like this guy:” Having already spent the cost of a hardware Bluray player ($100+) for their software equivalent, you can imagine I’m pretty reticent about being forced to it again. What’s worse is that I purchased PowerDVD in November 2014, meaning I had less than 18 months of trouble free use(!). Their latest version of PowerDVD is $125, and Lord knows how long that would function for…! Seeing how I legally own a Bluray player, and genuine Bluray discs, is there not any way I can manually update the AACS keys for PowerDVD myself?? This seems like yet another occasion where the pirates get a better deal than those of us who pay their money to do things legitimately :(“. So in order to solve “PowerDVD won’t Play Blu-Ray” problem, you can download and try another outstanding Blu-Ray Player – UFUSoft Blu-Ray Player, only $45 can get lifetime version and lifetime free upgrade. 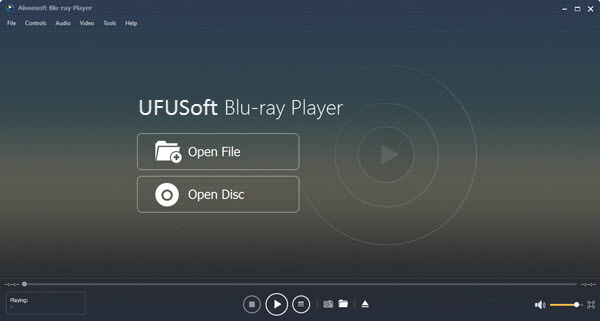 UFUSoft Blu-ray Player can play any Blu-ray disc released in different regions, Blu-ray folder and Blu-ray ISO image file. It can also play 4k or 1080P HD video and other any media file like MTS, M2TS, MXF, TS, MKV, RMVB, VOB, and FLV, etc. with high image and video quality. Blu-Ray Player supports Windows XP (SP2 or later), Windows Vista, Windows 7, Windows 8, Windows 8.1 and Windows 10. How to Play Blu-Ray without Cyberlink DVD? Step 1: Free download Blu Ray Player for Windows 10/8.1/8/7. Install and launch it. The Blu Ray Playersupports loading video from Blu-Ray disc, Blu-Ray folder or IFO file. Click “Open Disc” or “Open File” button to load your Blu-Ray movies. When movie is loaded, you can play Blu-Ray movies on Windows with outstanding and perfect video quality.